We may have won, but we’re not done. With our new contract, UAW 2865 — the union that represents more than 17,000 TAs, tutors and readers across the University of California — has won some of the most robust worker protections we have ever seen in our union’s history. Now, we must celebrate the victories we have achieved together. 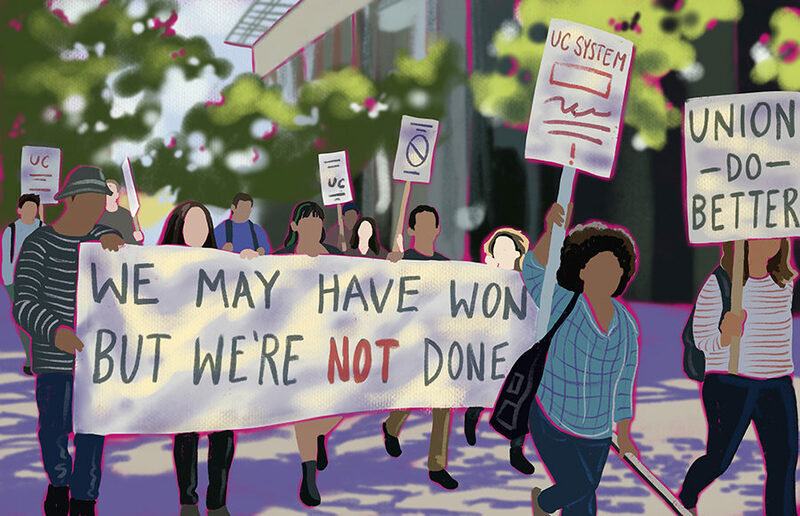 Now is the time to fight to make these protections real in our workplace and move on to the next stages in the struggle to create the “UC for All” we demanded in our contract campaign. This month, our union concluded a monthslong negotiations process with the UC Office of the President with the ratification of a new four-year contract. Our new contract is full of protections won by our workers who face the most barriers at UC, protections against sexual harassment and violence. Management began bargaining with the demand that we give up the right to file grievances over sexual harassment, which would force us to rely entirely on the inadequate Title IX process. This would have been a truly sexist contract in which every workplace violation could be grieved except for those involving sexual harassment. We won not just the right to keep our full grievance process, but also a broad range of survivor-centered interim measures, remedies and alternative resolutions. We won these new protections through countless conversations that brought workers together, petitions, legislative pressure and, above all, the iron will of survivors who testified at bargaining sessions. Now, we as workers can determine what a safe workplace means to us and decide what must happen to allow us to work without intimidation, isolation and workplace changes that place additional burdens on survivors. We won the right to use these same measures in cases of any kind of discrimination or harassment. In other words, for the first time ever, our contract contains measures to address racialized discrimination and all other kinds of discrimination and harassment. Our new contract also establishes important measures to protect workers from the precarity that threatens immigrant and international student-workers. Now, student-workers have paid leaves that allow them to miss work to attend immigration-related appointments and hearings — not only for themselves but also for close family members. Any worker who loses and then regains work authorization has a guaranteed right to meet with supervisors to discuss re-employment. Perhaps the strongest measure we won is a guarantee that the university will notify our union any time an immigration official makes an inquiry about one of our workers. With this kind of alert system in place, we can mobilize effectively to protect each other in the spirit of solidarity that is the heart of our union. These major victories are not all we have won. Workers with disabilities now have an interactive process through which to determine accommodations that meet their actual needs. For parenting student-workers, there is an increase in the child care subsidy and improvements to the conditions, accessibility and privacy of workplace lactation spaces. Another victory on union orientations means that now, workers have more protected time to educate each other on our rights and to set the stage for the collective struggle. Settling the contract does not mean the fight is over. The possibilities for our union to build power and demand justice are not limited to the incremental victories achievable in a contract campaign. In the wake of ratification, some unionists fixate on the missed opportunity to attempt a minority strike. But a union’s leadership cannot call on members to strike when a strike does not serve our and our fellow workers’ interests or is extremely unlikely to succeed. The legal “right to strike” that exists when a contract expires is not a strike itself. Strikes happen when workers make the choice to walk off the job. If enough workers are not ready to make that choice — as was the case for us now, demonstrated most recently in both the straw poll and the ratification vote — then it is wrong to bring the entire workforce off contract, forgoing raises and inviting employer retribution against a small group of actors, both at the bargaining table and in the workplace. We must have a broader perspective on building power, not only in our immediate workplaces but across higher education in California. From here, we must fight even harder for control over the conditions of our labor. In this contract, our union won wage increases of 3 percent per year and a $300 per year campus fee waiver (equivalent to another 0.55 percent for those workers who pay this fee). To fight on, we must now build enough power to win department-level pay equity campaigns, to win more in our next contract campaign and to organize with our sibling unions whose wage offers are still less than what we won. We must train all members to fiercely enforce our new protections and create an equitable campus where all can flourish, free from harassment and intimidation. We must extend union rights to our research assistant co-workers. We will not let UC rest until all workers have living wages, affordable housing, accessible mental health care and a safe workplace. Alli Carlisle is a doctoral candidate in the Spanish and Portuguese department at UCLA and co-chair of the UAW 2865 bargaining team.